Senyora Santibanez @Senyora is the Philippines’ most popular twitter parody account, so much so that it is actually the 47th most popular among all twitter accounts in the country. It’s safe to say that she’s more famous and has more clout than most real celebrities in the Philippines. With those stats, she must wield a lot of power – but does she even earn from it? In her timeline, I don’t see any tweets where she’s shilling for anything (I didn’t dig that deep by the way so I might have missed those tweets if there were any). In theory however, she can cash in or her immense popularity. Think about it, @Senyora can make something go viral. She can pluck nobodies from obscurity and push them into webstardom. The Pabebe girls’ (see their viral video here) rise into internet fame is largely attributed to her. If she can make mundane things into cultural sensations, surely she will have no problems hawking goods. As promoters, parody accounts have disadvantages. They crack jokes, and their advertisements may be misconstrued as jokes as well. Since they represent fictional people or objects, they lack the credibility of real persons – who can stand behind the goods they’re shilling. The worst that can happen is when a parody account starts advertising and its followers perceives it as selling out. The fans may “unfollow” in droves. These parody accounts have advantages. There are no cans of worms to open. They are virtually bash and hater proof. They have no vulnerabilities. Of course, that’s assuming that the real persons behind the parody accounts are never revealed. However, once these accounts do some form of advertising, they will have to shed their anonymity to business partners at some point. How much can @Senyora and her ilk charge? Popular real celebrities in the United States such as Kim Kardashian had been reported to receive USD 10,000 per sponsored tweet (read here). Being fake personas and with less followers, parody accounts receive less. According to this article (here), a parody maker claimed receiving USD 500 to 1000 per sponsored tweet. Not bad. 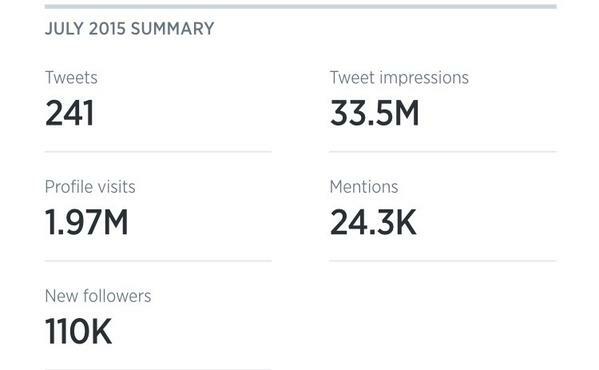 From her July stats above, 33.5 million impressions over 241 tweets result in almost 140,000 impressions per tweet. 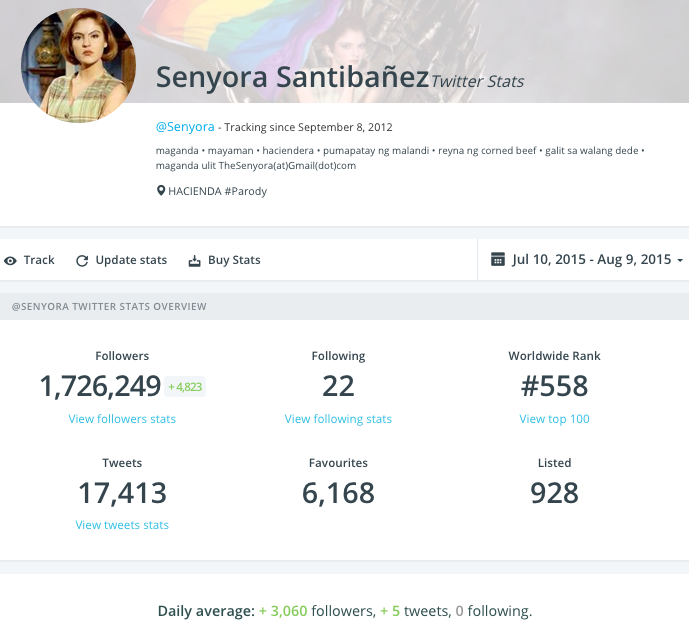 At a cost of $3.50 per 1K impressions, @Senyora should receive around USD 490 (around PHP 22 thousand) per tweet. Of course, a sponsored tweet may get more or less than the average impression numbers, depending on how followers engage with it. I’m assuming advertising rates are less for the Philippine market so that PHP 22K might be too steep. However, given her clout and how twitters users engage with her tweets, I think @Senyora deserves no less than a few thousand pesos per sponsored tweet. Her rates may also go up with time. Currently that account is the 47th most popular in the Philippines overall but it is rising through the ranks quickly. The account’s rating is scored 10 (the highest), meaning there is a very high likelihood that users will recommend the profile to their networks. See Philippine twitter ranking data here. A parody account may choose not to enter the world of sponsored tweeting by itself though. There is strength in numbers. In fact, the people behind parody accounts based in other countries have banded together to cross promote their handles, improve engagement and increase their bargaining power with advertisers. Read the article The Weird, Money- Making World of Parody Twitter Accounts here. Not all parody accounts are equal though, @Senyora parodies a villain from a soap opera (Senyora Angelica Santibanez, a character played by Chantal Andere in the 90’s Mexican telenovela Marimar). She doesn’t alienate anyone with that move. Compare that to other popular Filipino parody accounts such as @krissy_kalerqui (here, which parodies Kris Aquino), and @superstarmarian (here, which parodies Marian Rivera). The real Kris and Marian are not only very popular and well loved celebrities, they are also the country’s highest paid and most effective endorsers. Advertisers won’t likely dare take the side of their parodies. The Pabebe girls, who @Senyora help make famous, are now doing the rounds of television shows and pocketing thousands in appearance fees. In a fair world, @Senyora should get her share of that cash. Not the character @Senyora (the character doesn’t need to work, as she often says she’s filthy rich ha ha), but the actual person/s who’s working hard behind the scenes. She (or he?) deserves to be compensated. How does @Senyora begin to make advertising money? She declares herself the queen of corned beef. She can start promoting brands of those. I, and many of her followers, might just buy them.